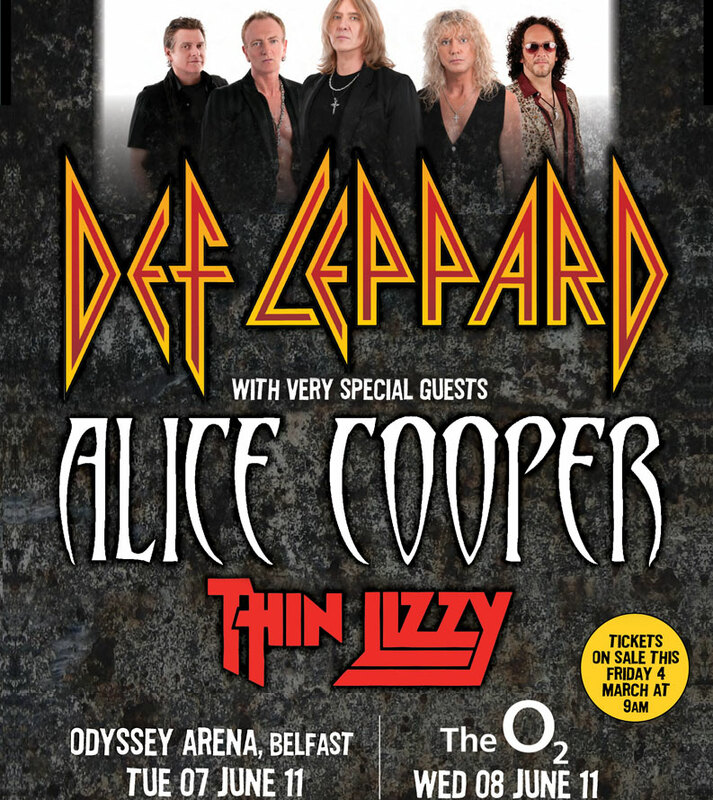 Def Leppard – Alice Cooper & Thin Lizzy Announce 2011 Dublin and Belfast Shows. Def Leppard has announced headlining shows in Dublin and Belfast with Alice Cooper and Thin Lizzy coming along as special guests. The gigs are set to take place in Belfast’s Odyssey Arena on June 7th and Dublin’s O2 Arena on June 8th. Tickets are priced at €59.50 for Dublin and £41.50 for Belfast (+ booking fee all the way) and can be purchased from our dear old chums Ticketmaster. This entry was posted on March 1, 2011 at 10:35 pm and is filed under Gig Listing, Music, News with tags Alice Cooper, Belfast, Def Leppard, Dublin, O2 Arena, Odyssey Arena, Thin Lizzy. You can follow any responses to this entry through the RSS 2.0 feed. You can leave a response, or trackback from your own site.